Describing my experience of reading and researching the works of Sor Juana Ines de la Cruz works in a message to my colleagues I wrote, “My mind and heart are so full right now that I can barely sit still enough to read. I feel like I am at a Sor Juana feast, where I am already full but I can’t stop eating because everything tastes so damn good.” Indeed, my living room presently looks something like an academic buffet table, with various monographs and essays about Sor Juana strewn about the coffee table and couch, each filled with bookmarks and sticky notes so that I can retrace my steps once my initial theological fervor subsides. What sparked this intense feeding on Sor Juana’s works for me? Drawing from a plethora of other scholastic, mystic, cultural, and political source, Sor Juana cogently articulates the relationship between the Creator and creation, using her own artistic production (dramas, sonnets, devotionals, letters, etc.) to make claims about how human beings can come to participate in God’s divinity. I was especially struck by the pronounced scholastic heritage in her work, emphasizing major 17th century theological themes such as truth, goodness, beauty, epistemology, will, imago dei, the relationship between grace and human nature, and the cultivation of virtue through practice. This influence is apparent in her portrayal of grace, human nature, self-love, and pride as having particular and intricate characteristics that distinguish them from each other and situate them within the larger salvation narrative as distinct but connected elements. [See Sor Juana’s drama Divino Narciso or Divine Narcissus] In this way, Sor Juana makes good use of one of the better features of scholastic thought – a painstaking concern with the relationship between the whole and the part. Further, Sor Juana’s use of scholastic categories allows her to address one of the most challenging questions for theology in general: what is the relationship between nature and grace? Sor Juana uses allegory to elucidate this challenging dynamic. Writing grace as a character in her drama, she portrays grace as distinct from human nature. While distinct from the protagonist, grace is a constant and faithful companion to human nature, accompanying her on the journey. Grace is a companion, advocate, and ever-abiding friend who gives freely and lavishly to human nature. Human nature, for her part, takes an amenable posture to grace’s friendship. In this allegorical construction, Sor Juana argues that grace is not an intrinsic element of human nature, but also that human nature is particularly receptive to grace. While grace is essential to human nature’s voyage towards the good, Sor Juana sets up a dialectic between God’s gratuitous grace and the necessity of human diligence in attaining it: “[Grace] is not in your hands, although you can apply your diligence to be well disposed to attain it. Human effort is not strong enough to merit it, although with tears you can beg to attain it as the gracious gift it is. For this is not justice, but grace.” [See Divino Narciso] Sor Juana is quite clear that grace cannot be manipulated by human strivings, but is always a gift. On the next page, however, she advises human nature to follow in her footsteps toward the pure fountain of life-giving waters. Thus, she exhorts human nature to walk with grace and move toward its telos in paradise. In this nature-grace scheme, Sor Juana simultaneously affirms the necessity of gratuitous grace and human diligence. This theological structure, well articulated by Sor Juana, raises a question that continues to be important for contemporary theoethical discourse: what is the relationship between grace and virtue? Virtue is certainly not alien to Sor Juana’s theology; it makes both implicit and explicit appearances in her works. Her conception of virtue is clearly influenced by her scholastic training and the pluralistic 17th century Mexican theological and philosophical milieu. 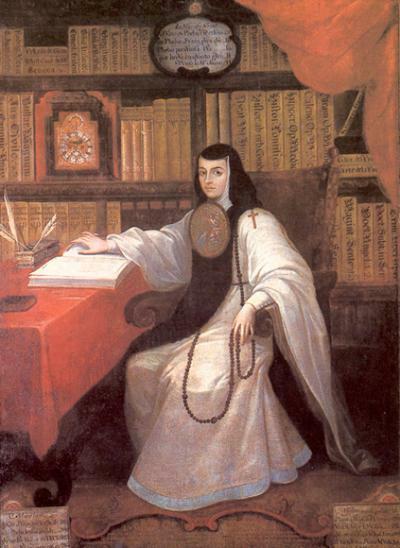 What I want to know is how Sor Juana’s conception of virtue both reflects and subverts the dominant virtue discourse of her day and, further, how her conception of virtue might relate to contemporary virtue discourse. I am still shaping answers to these questions for myself, but my hunch is that her articulation of the relationship between truth, goodness and beauty might serve as a fruitful framework to think about Christian morality. How does beauty relate to who we are becoming as human beings?